Finally, I saw my first day of sunshine in Scotland on May 30, 2014. Almost my entire trip to Europe had been blessed with warm weather and brilliant sunshine, but my first couple of days in Scotland had been dreary, clammy and wet. But not so on this day, as I walked from the Haymarket area of Edinburgh towards downtown and up to Edinburgh Castle. This was the meeting point for my one-day excursion with Timberbush Tours, a company that provides a variety of one-day, two-day and three-day tours of Scottland. 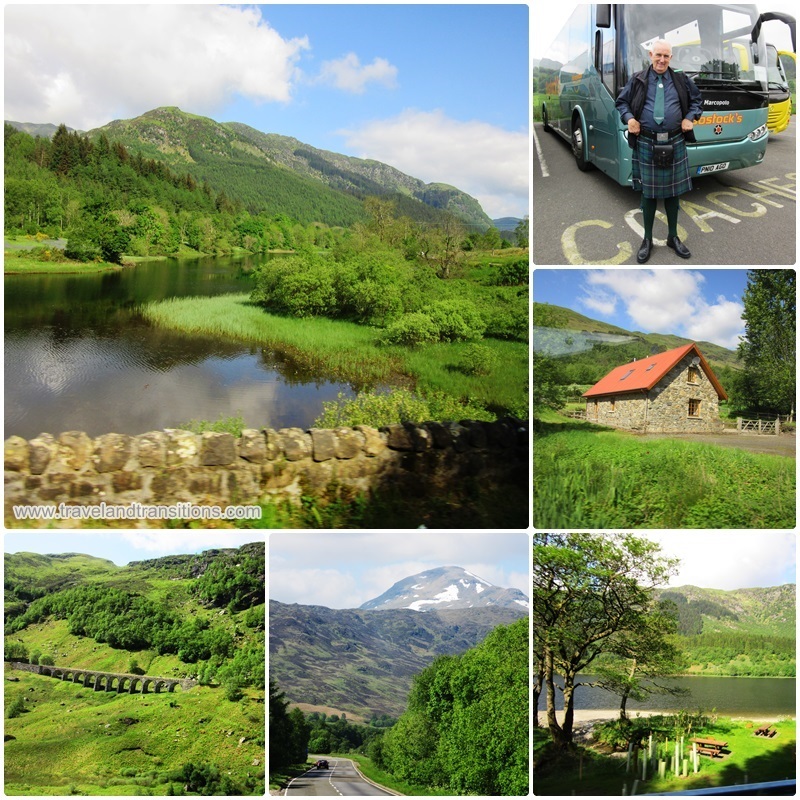 Their most popular one-day tour visits Loch Ness and the Scottish Highlands, and I figured a group tour would be a convenient way to explore the famous Scottish landscapes without having to rent a car and drive myself. 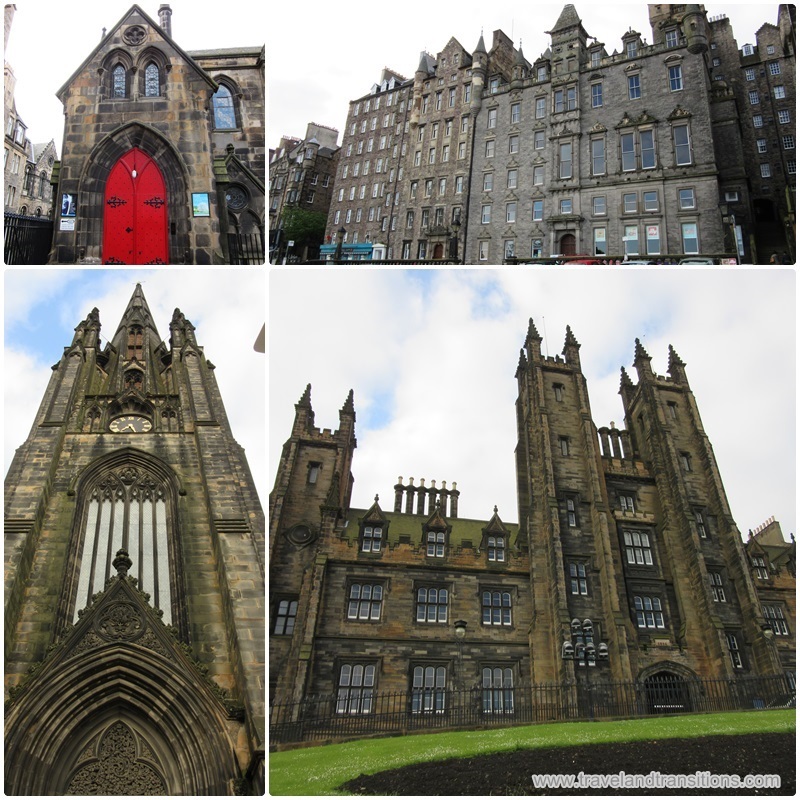 As our tour group was waiting for the bus to arrive, I took some photos of the impressive architecture in Edinburgh’s Old Town. The first stop on our one-day tour of the Scottish Highlands was in the village of Kilmahog in the Trossachs, a forested valley with several ”lochs”, the Gaelic word for lake. Our big bus pulled into the parking lot of the Trossachs Woollen Mill which allowed us a half-hour stop to use the facilities, have some breakfast or coffee at the snack bar and shop in the retail store of the woollen mill. 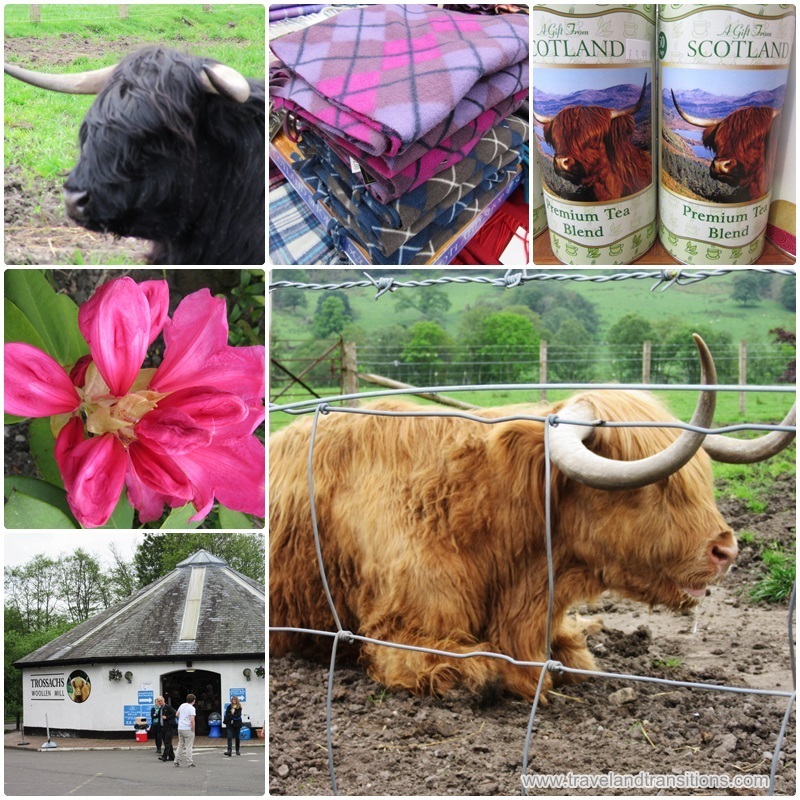 Scotland is renowned for its fine cashmeres, Scottish Tartan Wool Sweaters, Lambs’ wool Argyle Sweaters and warm woolen scarves, and in addition to wool products, the Trossachs Woolen Mill also has a great assortment of other typical Scottish products. The big attraction outside the building is Hamish, the famous highland bull. At 20 years of age, this fine bovine specimen is the oldest highland bull in Britain with horns that measure more than 1 metre in width. Hamish shares his paddock with Honey and Hamish Dubh, two young calves. All three of these animals are a great attraction for the various bus tours that stop at the Trossachs Woolen Mill. The drive through the Trossachs valley towards the Scottish Highlands was absolutely breathtaking. The bright spring sun was now bathing the verdant scenery in deep greens and we admired the various small hamlets and long lochs (lakes) that were stretching out in the landscape. Our bus driver was at the same our tour guide, and in his subtle Scottish accent – I surprisingly had no trouble understanding him – and in between jokes, he educated us about Scottish history. This is Rob Roy Country, so named after the Scottish folk hero and outlaw Robert Roy MacGregor, the Scottish Robin Hood of the early 1700s. The Scottish people are fiercely independent and Scotland’s history is full of fascinating stories of heroes, villains, deposed monarchs and bloody battles. 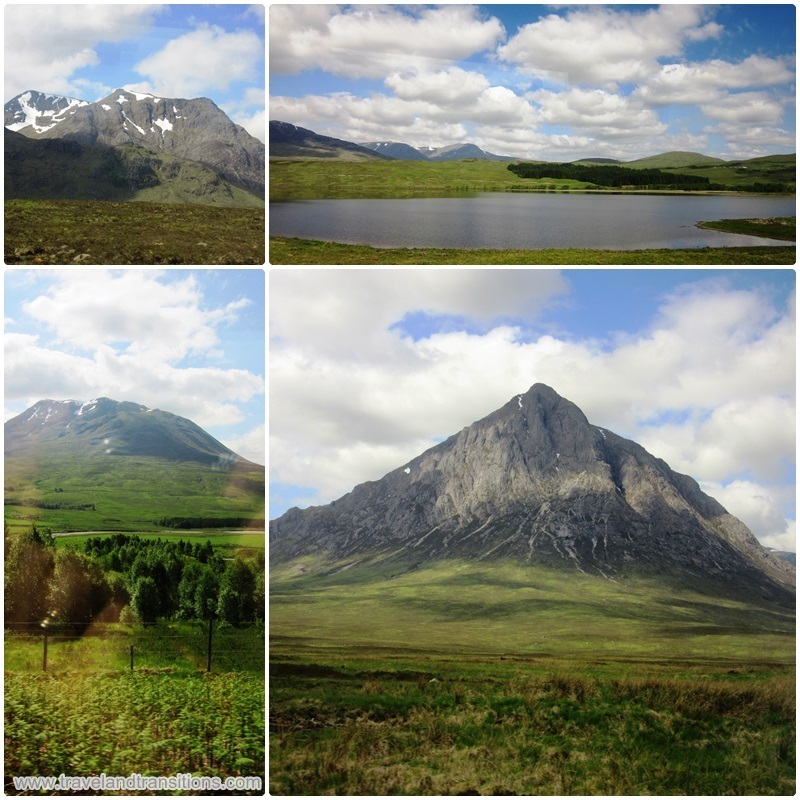 The Scottish Highlands are an ancient landscape with a fascinating and often turbulent history. Taking up the rugged northern and northwestern part of Scotland, the Highlands are made up of some of the planet’s oldest mountains, and over the millennia this mountain chain has been softened by the crushing impact of the glaciers. Due to factors such as the outlawing of the traditional Highland way of life after the Jacobite Rising of 1745, the Highland Clearances (the 18th and 19th century forced displacement of Highlanders from traditional land tenancies) and mass migration to the cities during the Industrial Revolution, the Scottish Highlands are today one of the most sparsely populated areas in all of Europe. At the same time, they are among the most mysterious and intriguing European landscapes and extremely popular with hikers, kayakers and other outdoor enthusiasts. 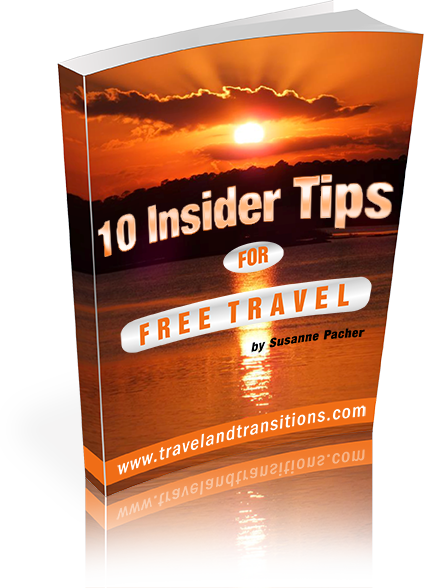 But they are also home to a variety of festivals, golf courses, upscale hotels and cozy bed and breakfasts, which provide a softer edge to these rugged landscapes.